If you're looking for a high-performance motorcycle that's lightweight and compact, one that specializes in adventure touring with the ability to explore further offroad when the tarmac ends, then look no further than the KTM 790 ADVENTURE. This sporty travel bike, with KTM's offroad genes, is built for endless travel enduro exploration and holds huge potential for offroad riding. Whether it's in the desert, on remote mountain trails or a transcontinental crossing, no other twin-cylinder travel enduro bike can match it. BODYWORK & GRAPHICS: The bodywork on the KTM 790 ADVENTURE has been kept to a minimum. The robust plastics have been manufactured in color to retain their appearance in case of scratching. The tank spoilers and rear side panels are slightly wider than the seat for improved control and to reduce wear and tear on the seat. The LED headlight mask is reduced, taking design cues from KTM’s rally bikes to create a slim, lightweight front end. The 790 ADVENTURE is available in two color options: orange and white. TFT DISPLAY: Reading valuable information like trip meter, fuel range, ABS settings and ride modes on the fly is made easier with the 5-inch, full-color, state-of-the-art TFT display. The rider can select which information to see and where they would like to have it displayed on the screen. The display's configuration is variable and automatically adapts to variations in environmental light. The rev counter blinks to indicate when to shift. LED LIGHTS: LED lights are used on the KTM 790 ADVENTURE as the main headlight, taillight and indicators. LED lights offer great illumination and visibility. They are compact, so they help reduce the overall volume of the motorcycle. CHASSIS: The KTM 790 ADVENTURE is a versatile motorcycle that’s ready to explore further in any conditions. It’s well balanced and purposeful, with sporty handling on the tarmac, and inspires confidence inspiring offroad. The advanced tubular CroMo steel frame and lightweight steel trellis subframe are engineered to be compact, but durable, to handle a full load on longer rides. A steering damper aids stability, while the heavy-duty spoked 21-inch front and 18-inch rear wheels are specifically developed for offroad riding performance. FRAME: The overall geometry of the KTM 790 ADVENTURE was developed for light handling and to be sporty on the street, comfortable for longer distances and with impressive offroad capability. Strength was a big consideration in the design, so a tubular CroMo steel frame is used with the engine acting as a stressed member to reduce weight and overall size. All design and engineering innovations are focused on being compact and light. SUBFRAME: When fully loaded for adventure, the bike underneath you need to be built to last. The steel trellis subframe was developed to be compact, lightweight and also strong enough to carry a passenger and luggage under the hard conditions that can be expected when adventure riding. SWINGARM: The signature die-cast, open-lattice swingarm is precisely manufactured and has been optimized for stiffness and stability while still offering excellent flex characteristics. By using a direct link for the rear shock, complexity and parts are reduced. The relatively long swingarm aids in traction, stability and suspension setup. ENGINE: The new generation LC8c in-line twin-engine with 95 hp (70 kW) – combined with modern electronics and a 6-speed sequential gearbox – ticks all the boxes for a travel enduro motorcycle that can be ridden up to 400 km between fuel stops on the open road. Smooth long-distance travel is assured thanks to two balancer shafts, which keep vibration to a minimum, and, with long service intervals of 15, 000 km, you can ride for days on end without a worry. CYLINDER HEAD: The 8-valve DOHC cylinder head contains twin chain-driven camshafts and two spark plugs (one per cylinder). The camshafts are assembled, making them lighter than forged camshafts, while the cam profile has been developed to create an especially torquey engine. The steel valves are opened by DLC coated finger followers and a hydraulic chain tensioner tensions the camchain. BALANCER SHAFT: When punching out those big long days in the saddle - on the tarmac linking up offroad sections - engine vibrations are kept to a minimum thanks to two balancer shafts, one in front of the crankshaft and the other in the cylinder head between the two camshafts. CYLINDER: The nicasil-coated aluminum cylinders are an integral part of the sleeveless engine casing. The open deck cylinder construction allows for optimal cooling, improved production tolerances, and reduces the potential for cylinder warpage during production. PISTONS: Forged pistons with three piston rings connected by a plain conrod bearing, combine with a DLC coated piston pin for reduced piston weight and thus less reciprocating mass. This results in a faster revving engine and allows for a lighter crankshaft, with reduced rotating masses and improved handling. CONRODS: High quality pistons are connected to the crankshaft by a forged and cracked conrod, which is carried by plain bearings. CRANKSHIFT: A forged one-piece crankshaft is held firmly in place by plain bearings with a 75-degree offset. The 435-degree firing order produces a sound similar to that of the larger LC8 engine, which makes the KTM 790 ADVENTURE feel like one of its V-twin adventure brothers when cracking the throttle open. CRANKCASE: The horizontally split crankcases are an aluminum high-pressure cast. This allows for reduced wall thickness for weight savings, and optimized surfaces, which allowed the engine designers more freedom in their design. The open-deck cylinders are integrated into the crankcase. OIL CIRCULATIONS: Oil circulation is based on a compact semi-dry sump system to minimize friction losses. The oil is actively pumped out of the crankcase, clutch housing and gearbox, which ensures that oil does not unnecessarily flow through the engine. The oil sump is integrated into the oil pump housing, together with two pumps (one scavenge, one pressure) and a pressure regulation valve. To cool down the oil, the engine is equipped with an oil cooler similar to the larger LC8 V-twin engines. PASC CLUTCH: The PASC (Power Assist Clutch) requires minimal rider input to operate it due to less engine torque transferring to the clutch plates. The slipper clutch on the LC8c is similar to that on the LC8, but more compact and therefore lighter. It prevents destabilizing rear wheel chatter when braking sharply or decelerating. It also reduces the hand force required for changing gears, allowing the clutch to be controlled with one finger - saving you energy when riding. GEARBOX: The 6-speed sequential gearbox's stacked configuration reduces engine length, which enables it to be more compact. Gear shifting is very smooth, and by using the optional Quickshifter+ clutchless up and downshifts can be performed effortlessly. RIDE-BY-WIRE: KTM's ride-by-wire system electronically translates the throttle commands of the rider into optimum throttle valve positions for the specific riding situation. ERGONOMICS & COMFORT: The KTM 790 ADVENTURE’s ergonomics allow it to perform as brilliantly offroad as is does on. A low-slung fuel tank lowers the centre of gravity, improves handling, and allows the rider to move around more freely. At high speeds on the open road, the 790 ADVENTURE benefits from a higher screen, which offers maximum wind protection, while the twin-seat design ensures both rider and passenger are comfortable on longer trips. HANDLEBAR: An aluminum-tapered handlebar allows maximum control while offering a comfortable riding position. The handlebar can be mounted in six different positions, which results in 30 mm of adjustment range allowing for a personal fit. 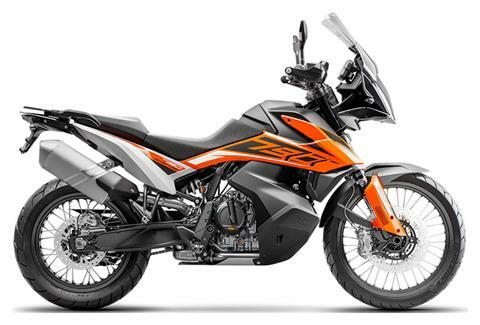 SOFTWARE & ELECTRONICS: Ride modes allow the rider to adapt the behavior and feel of the engine, while KTM’s lean angle sensitive traction control system (MTC – Motorcycle Traction Control), reduces wheel spin based on the chosen mode or riding situation. KTM’s cornering ABS system allows riders to use the full power of their brakes while taking the lean angle of the motorcycle into account. It has an advanced offroad mode that can also be turned off. MTC (MOTORCYCLE TRACTION CONTROL): The MTC (Motorcycle Traction Control) is a lean-angle sensitive traction control system that reacts immediately the instant rear wheel rotation speed becomes disproportionate to the riding situation. In mere milliseconds, MTC reduces engine output with an extremely smooth, barely perceptible intervention at the throttle valves until slippage is reduced to optimum proportions for the selected ride mode and current angle of lean. For particularly ambitious riders, the traction control can also be switched off. CORNERING ABS: KTM’s cornering ABS system allows riders to always use the full power of their brakes while the system adjusts brake pressure to match the lean angle of the motorcycle, for safer and more predictable braking across a wider range of conditions and scenarios. It can be turned off for offroad conditions. OFFROAD RIDE MODE: ‘Offroad ride mode’ has a smooth throttle response and allows a fair amount of slip before it intervenes. On low grip surfaces, a certain amount of wheel slip is needed to ensure forward motion. Secondly, it allows riders to break traction so they can steer with the rear wheel. Anti-wheelie is not used in this mode, so riders can easily lift the front wheel over obstacles. ‘Offroad ride mode’ is not lean angle sensitive, so traction control does not intervene when a rider uses a berm to turn. OFFROAD ABS: By selecting offroad ABS, ABS is deactivated on the rear wheel, while front wheel ABS intervention is reduced and data from the lean angle sensor is not considered. This allows riders to lock up the rear wheel, which can be used to steer into corners. It reduces the tendency of the ABS on the front wheel to regulate on loose surfaces, thus balancing decent stopping power with secure braking in the dirt. The settings were developed for maximum braking power with minimal electronic intervention in all scenarios. X-Ring 5/8 x 1/4 in.